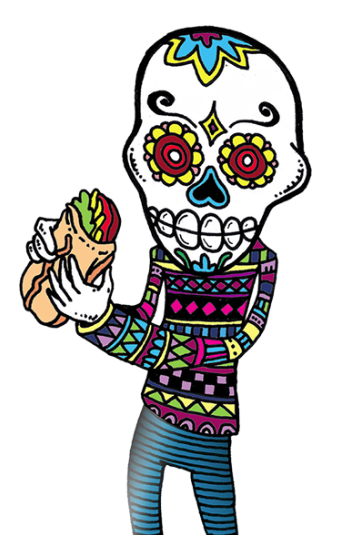 Flaming Cactus was born out of our love of fresh, authentic Mexican street food, with the express purpose of bringing tastier and healthier food to UK festivals and events. In 1996, Roland, one of the Flaming Cactus fathers, budding cook and food fanatic, set off to study in the heart of San Francisco, home to the USA’s largest Mexican community. Blown away by the Mexican food of the Mission District, he learnt the tricks of the trade before heading down to the Baja Peninsula, where he refined his authentic culinary skills. Meanwhile, back in the UK, Andrej, father number two, was enjoying the British festival scene. Although the music always came up trumps, he found the 90s' food sincerely lacking in quality, choice and affordability. After his last trudge through a muddy field in vain search of wholesome, affordable food, he decided that something needed to be done. By 2003, the first Flaming Cactus airstream arrived on the festival circuit. Since, we have been celebrated for our high-quality food, fresh ingredients and vibrant flavours. We have been featured in the Guardian’s ‘World Best Street Food’ and ‘Not a Hotdog in Sight’ articles, are winners of the NCASS ‘Mobile Caterer of the Year’ award, and won the ‘Street Food Heroes’ title in the British Street Food awards, 2012.